A short guide to Durga Pujo and the food around it. Click on the food names to get the recipe. This recipe is in the book and being reposted. Original date: Nov,2009. Tomato Chaatni was my staple diet as a kid. That and Chanar Dalna. I don't remember eating anything else much as a 5 year old. My memory has gone bad so I don't remember too much but the red tomato chutney still glistens on the steel tiffin carrier that the help along with my Mom would bring for school lunch every day until Grade 2. Tomato chaatni to me means a safe haven of home amidst strict nuns, new friends and a foreign language that I didn't understand. Later the aamer ambol pushed tomato chaatni to second place but a childhood sweetheart always has its own special corner. So one of these weekends we were at this lunch at a friend's house. When I had first met her a couple of years back, she had thrown me off by saying that she makes experimental dishes like chicken with cauliflower. She didn't even say that it tasted great or anything re-assuring about it. So the first time she invited us for dinner we went with a lot of trepidation. She is wonderful company and we thought that the evening would be great even if the chicken had cauliflowers. It turned out she is a wonderful wonderful cook, all her dishes are fabulous and none of them were radical.The last time we were invited for lunch, she had made 70 vegetable chops, all perfectly shaped and fried. Ok, just to get things clear there were more people and we didn't eat the chops just by ourselves. Her Tomato chutney or tomato chaatni was really good, studded with raisins, dates and aam shotto, it tasted heavenly. But there was a tang in that chutney that is missing in mine which I just attributed to her good cooking. Later when I asked, she told me she had added some tamarind chutney to the tomato chaatni and that was the secret to its tangy taste. And then I remembered my Mom adding a little tamarind pulp to her tomato chutney too. How did I forget ? In fact my Mom sometimes would add whole tamarind, pits and all to the tomato chaatni and now that I remember I can hear the clatter of the deep brown tamarind pits on the steel plate as I sucked them out clean. 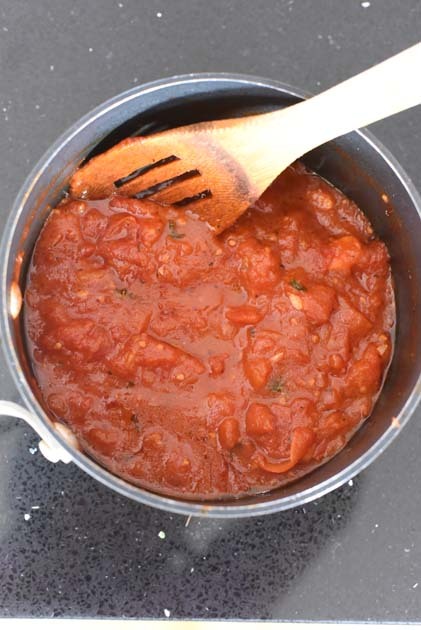 More than just the tamarind pulp the sweet-sour-spicy tamarind chutney really lends a nice dimension to the tomato chutney and makes it delicious, so do try it next time. Khejur or dates is the perfect company for the tomatoes in the chutney and that is how it is almost always made in a Bengali home. The aam shotto or aam papad/dried sweet mango slices is another delicious addition to the traditional Bengali Tomato chutney. Sadly I had none and so couldn't add any. I have also made tomato chutney with cranberries when they are in season, the cranberries also add a nice tartness to the chutney but I must say I like this one better. 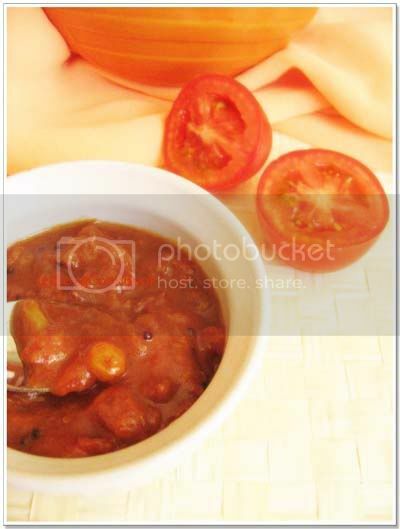 Once the tomatoes are almost done, add the chopped dates, about 1/3 cup of golden raisins and stir well. If you have amswatta, add some chopped now. Add about 1 tsp of ginger juice, grate ginger and squeeze to get the juice. Add about 1/4-1/2 cup of water and cook for a few more minutes till the tomatoes have totally disintegrated and thoroughly cooked to a soft pulp. Now is a small tip. 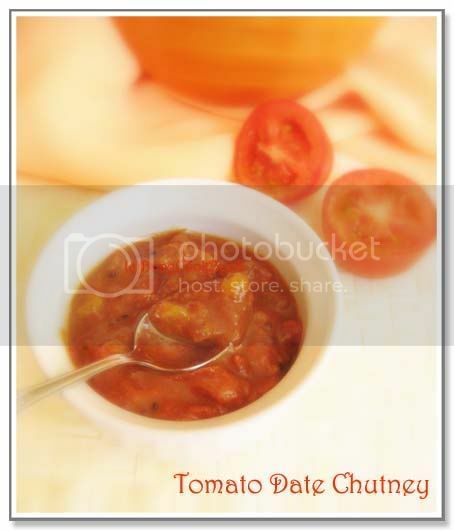 To make the chutney tangy add 1-2 tbsp full of a tamarind chutney to the tomato chutney. You can use a store bought one or make one of your own using tamarind pulp. This really gives the chutney a sweet-tangy taste instead of just sweet. Before serving, sprinkle with dry roasted cumin powder or dry roasted and ground paanch-phoron powder. Updated on 11/10/2009: As I said in an earlier post a traditional Bengali meal usually consists of five to six courses, starting off with something bitter and ending with a sweet dessert. The fifth course served just prior to the dessert is the sweet & sour ambol or chutney. Dice 250 gm tomatoes . Temper a tsp pf paanch phoron in a little oil, add the tomatoes - add 1 cup of sugar . Cover and cook. Don't add water . You can also add some raisins . This tastes yummy. 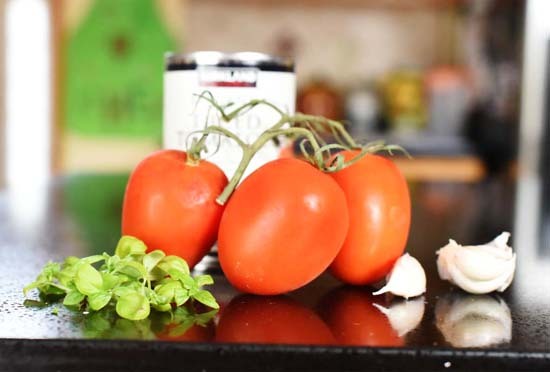 The tomatoes cook in the juice released from the vegetable as well as the sugar . My relation with Pasta is not something that goes back to my grandmother's or even my Mother's kitchen. My grandmother had no idea about it and my Mother didn't care about it. It wasn't a food that we even craved for. As a middle class Bengali, way back in the 90's, I don't think we had much idea about Italy beyond Roberto Baggio,Salvatore Schillaci, Michelangelo and Pope John Paul 2, in that order. We weren't bothered about what Italians ate. Though Pizza had found its way in middle class Indian homes in the early nineties and was described as a kind of "ruti" with ketchup and Amul cheese on it, it was embraced as a food which the rich Americans with poor eating habits, survived on. Very few of us deemed it as food from Italian kitchen. In those days, Domino's and Pizza Hut were not familiar names and Mongini's was where we got our pizza from. Mini round thick crusts with onion, pepper and cheese on them. I think they also sold pizza bases there which I remember getting a few times. My Mother had this round electric oven, shaped like an UFO. It had a glass porthole at the top of the aluminum lid and couple of times a year, she used this contraption to bake a cake. On all other days it rested on the top of our Godrej almirah, wrapped in sheaths of plastic. I remember the few times that I made pizza in that oven. Squirting ketchup on the pizza base, shredding Amul cheese on it and then watching the cheese melt through the porthole, I am sure I felt like a pioneer ushering in a new cuisine at our modest dining table. But did we ever try eating or cooking Pasta ? Nope. Never. Until that is I started working in Bangalore in the late nineties and had a first taste of Casa Picola's delicious Pasta. I have no idea what kind it was but was in a creamy white sauce which was so subtle that it just tickled your senses without over powering it.It had capers and olives and was utterly delicious. That is what I thought was Pasta and loved it. And then we came to the US. My first encounter with Pasta here was a disaster. At one of those "American-Italian" restaurants that are so popular here, I was served a plate of squiggly spaghetti drowned in a scarlet red colored marinara sauce, which was so bad that I sweared to stay off Pasta all my life. 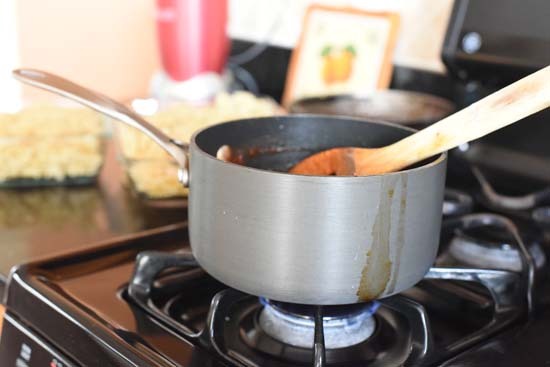 I never really tried eating or cooking pasta there after, except at a Bengali friend's home, who made elbow macaroni with onion, eggs, vegetables and soy sauce, in a similar manner that we make stir-fried noodles. It was so good and for a long time that was the only kind of Pasta I would eat. But after Big Sis was born and started going to pre-school, pasta re-entered our home. It seemed like a lunch which a 3 year old could easily eat by herself at school. Even as I tried to come to terms with the wonder of pasta, elbow shaped Macaroni or "Macu" climbed the charts in Big Sis's favorite foods list.